Does your website still have an Adobe Flash player on it? Adobe Flash was popular when the majority of Internet users were on desktops. In 2014, it’s a different story. With mobile browsing increasing at a “whopping 85% growth – from 11.37% in Q1 of 2012 to 21.02% in Q1 of 2013 alone” your site will simply be missed or quickly dumped before conveying your useful message. People searching for goods and services on the Internet appreciate a mobile-optimized website. It tells potential consumers that your company is up to date and ready for business today. Your website only has about 3 seconds to make it’s first impression. That’s 3 seconds to show what you’re about and how you can help. 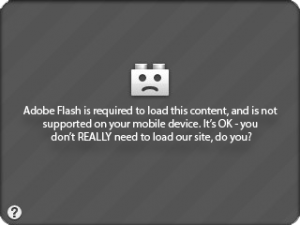 Displaying “Adobe Flash is required to load this content…” will not get the job done. Nik Wenzel, from 435digital.com, has done a great job detailing 4 simple and practical reasons why you should stop using Flash on your site. Index-able content, an intelligent URL structure, and rich title and meta descriptions will go a long way in bringing organic search traffic to your site. Unfortunately, with Flash, you lose all of these elements, leaving you to more time-intensive and expensive methods of drawing online traffic to your business. Imagine this: you want to scan your phone book for a few numbers, and perhaps even look through the yellow pages to find a local business. Problem is, the phone book was sealed shut when it arrived to your house. How are you going to get any information out of it – let alone connect with the businesses that paid good money for those listings. In this same way, Flash serves your content in a way that seals off search engines from your data. Instead of serving your website in the “traditional” sense, through a series of indexable files that can be optimized for search engines, it gives all of your content to the browser in one pile of code that isn’t indexable by most search engines. How will search engines help potential customers reach you and your business, if those search engines can’t even crawl your content? Speaking of your content, should it really be a luxury to have the ability to easily update it? Content Management Systems have long been the most effective means of managing your web presence, from copy, to media, to navigation and your SEO tactics. Once a Flash based site is deployed, many of these benefits go out the window. Not only can you not effectively manage your link structure, but even editing simple sentences require the developer to re-open your file(s), make the edits, re-compile and then re-deploy the package to your server. Not only is this time intensive, but it’s slow and can be extremely costly for even the simplest of edits, compared to the time and costs needed to edit your content with a CMS. It’s no secret that mobile browsing has been on the rise for years – Monetate’s 2013 Q1 analysis of web traffic between platforms shows a whopping 85% growth – from 11.37% in Q1 of 2012 to 21.02% in Q1 of 2013 alone. Client projects need to be future-proof in today’s world, and Flash-based features just don’t have a place in that trajectory. The two main dogs in the mobile-browser fight, Apple iOS and Google Android, have both either dropped support, and in Apple’s case, flat-out refused to support the platform in the first place. What was once a key difference between the two platforms (and core argument of aforementioned fanboy brawls) has ceded to reason. Flash based content just isn’t optimized for mobile browsers, and usually too bulky to deliver efficiently. Not only does flash not work on most mobile devices, but it’s nothing short of a liability on those platforms on which it does render. Who could forget the platform’s disastrous Android debut at Flashcamp Seattle in 2010, when it crashed twice without even successfully loading a page? Rendering errors, slow load times, and nagging bugs plagued the platform from the start, effectively sealing it’s fate on the mobile front. When it comes down to it, Flash is capable of some incredible things. Unfortunately, with the platform’s market share shrinking steadily, developers need to come up with a more future-proof solution. If only we had access to a platform that could serve video, web applications, and even custom graphical interfaces, without all of the drawbacks? Oh wait, we already have a platform that can accomplish most of that? And, it’s even cross-browser friendly, based on open sources, and easy for developers with HTML/CSS skills to pick up? Yes! HTML5 and CSS3, the W3C’s latest and greatest achievements, are extremely powerful platforms from which developers can build out the content-rich web experiences Flash has spoiled us with, all while adhering to standards that are accessible to modern browsers – desktop OR mobile. Granted, HTML5 development is still in it’s infancy, but given it’s incredible power and flexibility, it provides a truly superior approach when compared with the alternatives. After all, if HTML5 can actually render Quake II in your internet browser, surely it’s then powerful enough to power your website?